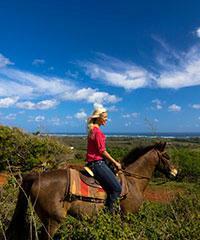 Horseback riding on Oahu comes with an array of options, with many at discount prices. Would you like to ride on the beach next to a world famous Polo field. How about in a valley so beautiful that it has been the back drop of many of the famous blockbuster movies you have seen over the years. How about a 350 acre private ranch overlooking the Waimea Valley on the islands's North Shore. How about 400 acre working cattle ranch on the North Shore offering a number of options for rides. 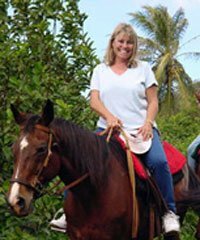 Yes, that's right, your are in 'horseback heaven' on the island of Oahu and many of these horseback rides we offer are available at discount pricing. 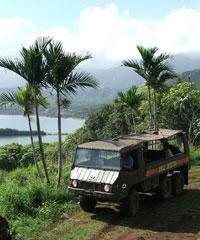 You will need a car or other form of transportation to get to your Oahu Horseback Riding Tour. Each and every one of the tours for horseback riding on Oahu are located in what is referred to by the locals as 'the country'. This means that they are quite a distance from the hotels and hub-bub of activity in Waikiki and Honolulu. Because you will either be headed out to the North or East shores of the island you may want to dovetail your ride with some sightseeing of these areas or perhaps with another activity located near by. Most people don't appreciate that Oahu has many remote and less populated areas that are extremely beautiful and these ranches offering horseback rides reveal the spaciousness and allure of these locations. 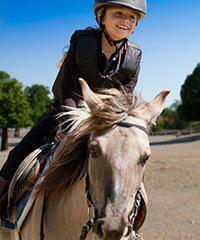 There are various types of horseback rides available to you. Do you still have questions about Horseback Riding Tours? Can we ride on the beach on an Oahu horseback ride? Well, this video segment is going to be about horseback riding on the island of Oahu. So Oahu, just like the other Hawaiian islands is steeped in the history of the Hawaiian cowboy, the Paniolo, the men who took care of the cattle on the cattle ranches throughout all the Hawaiian islands. And it's really deep into the culture of Oahu. You'll see that the local inhabitants and the people who live there have regularly scheduled rodeo events and all sorts of competitions regarding horseback riding. There is a number of different rodeo events that will happen throughout the year; some for high schools, some for off island groups that come in for various events on different occasions. You've got the bull riding. You've got the roping of all kinds, the barrel racing and all this that goes on on a regular basis, scheduled throughout the year on Oahu. So there is a big culture in general of horseback riding that happens on Oahu. 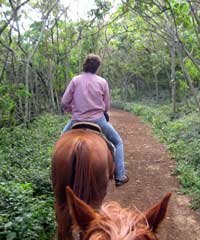 Now, if you're visiting on Oahu and you're interested in horseback riding there's a number of opportunities that you've got to do such. The island of Oahu. You as a visitor, primarily will be staying in the Waikiki, Honolulu area down here. This is kind of the zone that you'll find yourself in, most people. But the ranches that we have, the places you'll be going doing horseback are more up in this area, kind of on the northern shoreline. We have a number of different ranches that all have different aspects about them that make them really very different and very beautiful for different reasons. We have them up overlooking the Waimea Valley, forested areas up there, beautiful views, tours that can take smaller children, like five years old and over. So it's a little bit ... Some of them are somewhat smaller, shorter rides, a little bit more docile in some ways but perfect for a person who just wants to get out and be on a horse and ride through the jungle, especially if you've got children you want to bring. 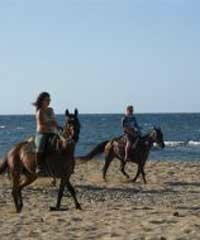 We also have tours that, horseback rides that parallel the beach up on the northern shores and these are particularly beautiful at sunset time and it's one of the few opportunities you can get actually near a beach to ride along on any of the shores of Hawaii. And so that's a popular choice. People love it. We have areas along this coastline, one beautiful ranch that's out there that a number of different rides happen that can kind of be tailored for different riding levels, different experience levels and also for different occasions. We had a guy a couple years ago I remember. On the phone he was interested, wanting to propose to his girlfriend someplace. That was kind of ... that would be neat. They did have an affinity, the two of them, for horses and it was like yeah, maybe that would be kind of a neat idea to do something on horseback and ended up up at this ranch, had a situation where we had just the two of them go out on a ride with someone who was going to be with them and kind of led them up through the ranch to one beautiful overlook and then the guy disappeared. 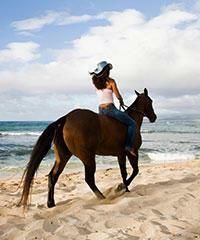 Kauai has a wonderful selection of horseback riding tours ranging from mountain to beach rides. Use our chat, videos, and maps to find the best of Hawaii's activities.